BROOMALL, Pennsylvania (September 15, 2016) – The nominations are in, the CPA-certified company data has been reviewed and the tabulations are complete. From hundreds of exciting companies from throughout the region, the 100 fastest growing businesses in the greater Philadelphia area have been identified. 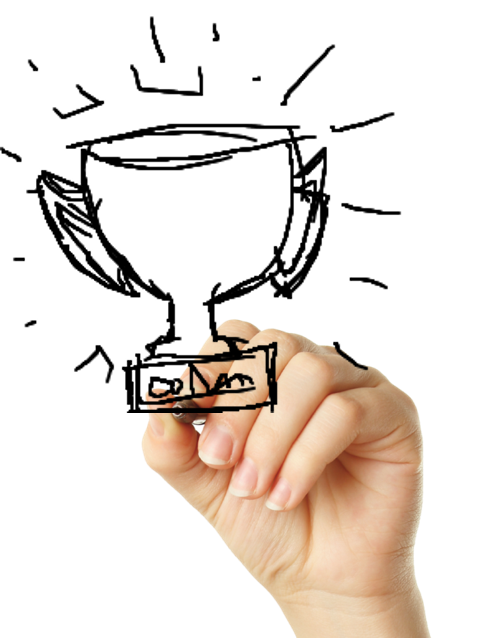 Partner’s Consulting is pleased to announce their inclusion on this year’s. 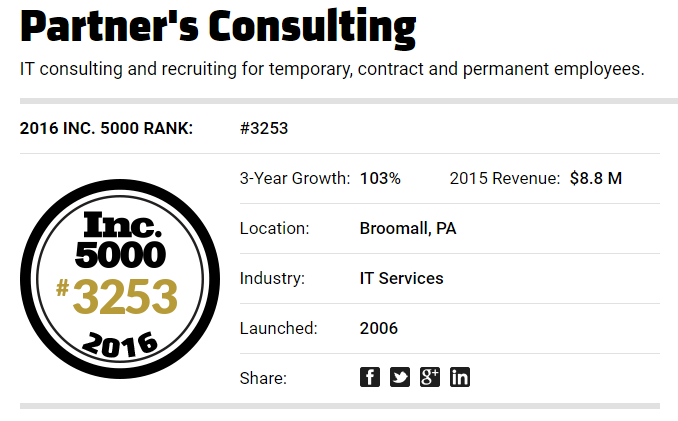 . .
BROOMALL, Pennsylvania (August 17, 2016) – Partner’s Consulting is pleased to announce their recent inclusion on the annual Inc. 5000 list for the 5th consecutive year. The list represents the most comprehensive look at an important segment of the economy—America’s independent entrepreneurs. “We are extremely proud to be once again recognized as one of America’s. 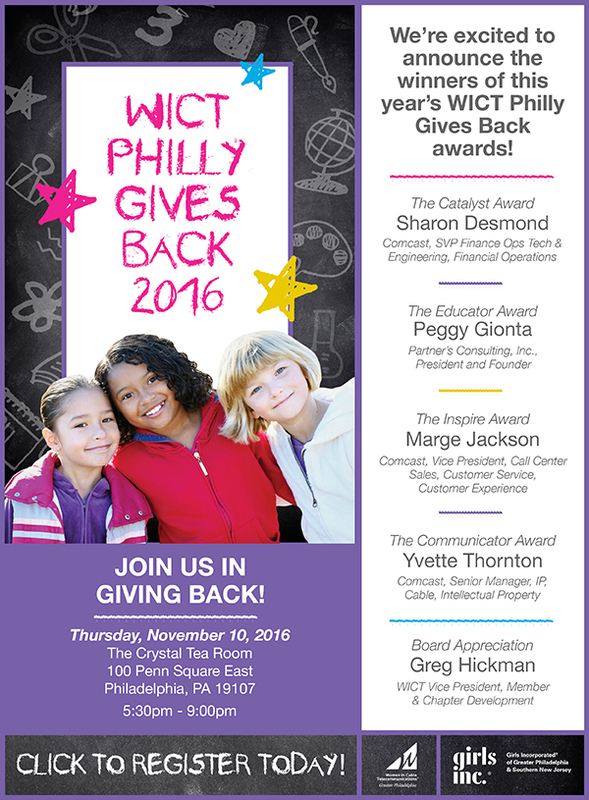 . .
BROOMALL, Pennsylvania (July 17, 2016) – The Women in Cable Telecommunications’ (WICT) Greater Philadelphia Chapter have announced the winners of the WICT Philly Gives Back (WPGB) awards, which honor female leaders in the Telecommunications industry who embody the spirit and values of WICT and are dedicated to giving back personally and professionally. At this year’s. 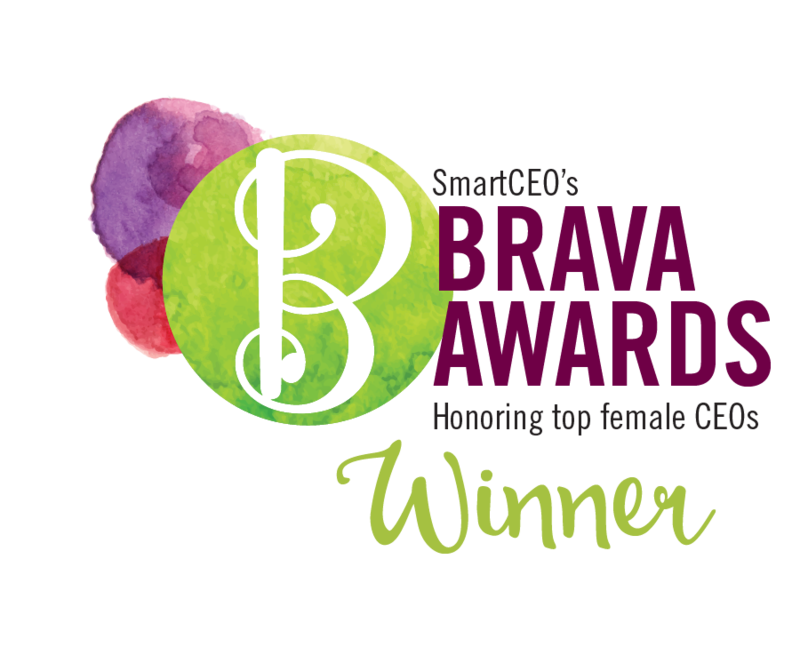 . .
BROOMALL, Pennsylvania (July 13, 2016) – Partner’s Consulting is proud to announce that its President, Peggy Gionta, has received the Philadelphia Chapter of SmartCEO’s Brava! Award. Philadelphia SmartCEO recognized the area’s top female CEOs, Executive Directors of Nonprofits, and C-suite executives at the 2016 Brava! Awards, which took place on Tuesday, July 12 at the. . .
BROOMALL, Pennsylvania (June 23, 2016) – The Main Line Chamber of Commerce honored Partner’s Consulting with the 2016 “Medium Business of the Year” award during its 16th annual Celebration of Business Leadership luncheon. The ceremony was held at the Desmond Great Valley Hotel and Conference Center, and took place along with the celebration of the. . .
BROOMALL, Pennsylvania (February 2, 2016) – Partner’s Consulting, an award-winning IT consulting company based in the Philadelphia area, celebrated its 10th anniversary as a leading provider of Professional Services on “The Business-Side of IT,” focusing primarily in Project Delivery and PMO/PPM. Established in 2006 by Peggy Gionta, and designed to be a true connector, Partner’s. . .
PHILADELPHIA, Pennsylvania (Jan. 7, 2016) – Philadelphia SmartCEO and Headline Sponsor Comcast Business are pleased to announce the 2016 Future 50 Award winners. The program recognizes the region’s 40 fastest-growing mid-sized companies and 10 small Emerging Growth companies who have experienced outsized growth based on a combined three-year average of revenue and employee growth. The. 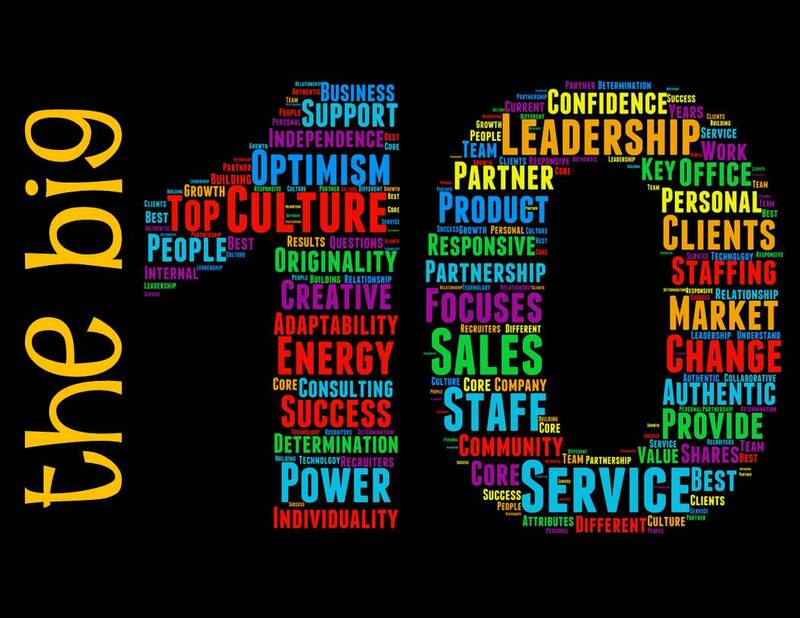 . .
BROOMALL, Pennsylvania (December 17, 2015) – Philadelphia SmartCEO celebrated 50 companies in Greater Philadelphia that have successfully championed positive, productive and performance-driven corporate cultures, and have worked with their employees to develop impactful practices. The Corporate Culture Award winners were profiled in the November/December issue of Philadelphia SmartCEO magazine and celebrated at a fun-filled event. . .
BROOMALL, Pennsylvania (October 21, 2015) – Partner’s Consulting celebrated their third consecutive year on the Philadelphia 100 list with an impressive top 75 placement at the Philadelphia 100 Awards program on October 15, 2015. This year’s top growing companies earned $950 million in combined revenue and an average growth rate of 85%. Partner’s Consulting has. . .
PHILADELPHIA, Pennsylvania (October 9, 2015) – Today the Philadelphia Business Journal released the results for the Best Places to Work in Philadelphia. After a months-long nomination process, Quantum Workplace surveyed employees at the nominated companies and identified 53 winners based on the scores. The companies were broken up into categories based on the number of. . .